Quang Tri DPO Deputy President Ho Thi Hue facilitates the information session and answers queries raised by disabled persons residing in Cam Thuy Commune. 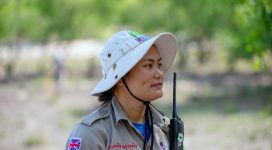 “Because of my parents’ prejudice that a disabled girl could not get married, “ said Nguyen Thi Khiem, “it took me more than eight years to marry the man I fell in love with.” Visually-impaired, Ms. Khiem is a resident of Cam Vu Village of Cam Thuy Commune. The 50-year-old mother of two was sharing her stories with others at an information session for disabled persons hosted by the Quang Tri Disabled Persons Organisation (DPO). 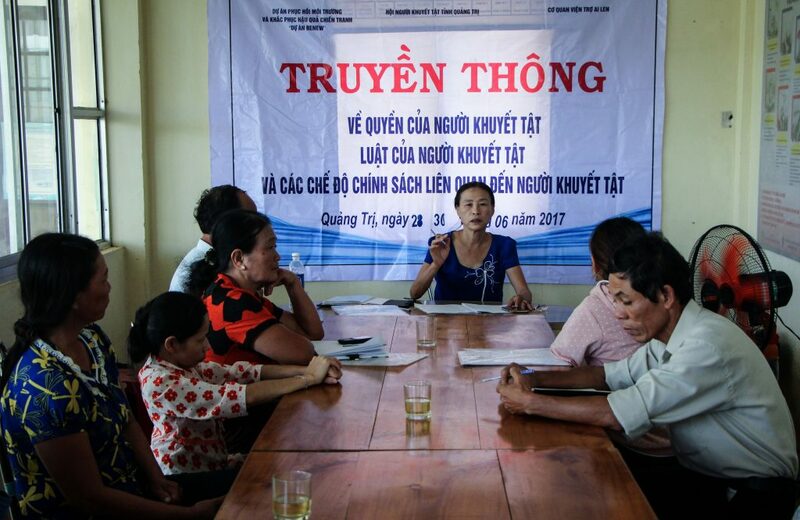 The mother of two boys, Ms. Khiem was among 20 disabled persons present at an information session that explained the Law of Disabled Persons, rights guaranteed to disabled persons, and government disability policies in support of disabled persons. 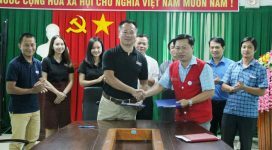 The meeting was held Friday at the Cam Thuy Medical Station. Attendees came from clubs organized by disabled persons from 11 villages in Cam Thuy Commune. The June 30th information session was the first of its kind in their home villages. Other participants included representatives from the Commune Women’s Union, and officials and staff from the Labor, Invalids and Social Affairs Section, on hand to answer questions from disabled persons regarding disability policies of the government. So far information sessions on the Disabled Persons Law, rights of disabled persons and government policies related to disabled persons have been conducted by RENEW and DPO in 21 communes of seven districts (three communes for each district). In July, the two remaining districts of Gio Linh and Vinh Linh will be covered in the implementation plan. Having lost her limb in a work accident while employed at a cement factory, Hue has undergone many ups and downs in her life. Now she manages a company that makes interior carpentry products employing seven skilled workers. Her company has hosted many vocational training courses for young disabled people who wanted to find jobs. Another disabled woman, Ms. Nguyen Thi Khiem, said that four years ago she took a bold step and borrowed 30 million VND (equivalent to $1,500) from the Provincial Bank for the Poor to start raising breeding cows. Now she has nearly paid off her debt and is earning from 10 to 15 million VND per year (about $440 to $660 USD) in extra income. Mr. Nguyen Van Nam, Head of the Advocacy Committee for establishing Cam Lo District DPO, says that Cam Thuy Commune has 225 persons with disabilities, mainly caused by birth defects, bomb and mine accidents, exposure to Agent Orange/Dioxin, and work accidents. “Disabled persons in general and disabled women in particular have had to cope with many disadvantages due to prejudice from society and families,” Nam said. 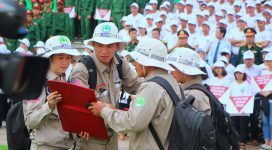 “If they are well aware of their rights, I believe that disabled persons can be confident enough to master their lives, like Hue and Khiem have done,” Nam said. Most of the disabled persons at the meeting said what they would like to see from the community and organizations that wish to help disabled persons is to support them in generating income from small businesses, raising fish, chickens, and cows, and making handicrafts such as brooms and joss paper.